Where can I see a Lifetime Tiki in person? At any of our upcoming trade shows - check out the Events Page for details! What size Tiki Huts are available? Sizes from 6’X6’ to 20’ X 30’ and up are available. How much do the Tiki Huts cost? 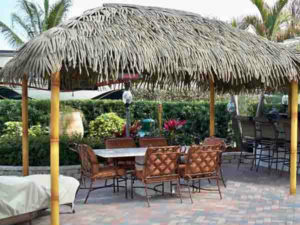 Tiki Huts can cost $100-$150 per square foot, depending on options. Is delivery and installation available for Tiki Huts? 20 years on Thatch and 5 years on the aluminum frame. Does the Thatch fade over time? Fade is minimal due to built-in UV Protection. Can I leave the Tiki Hut outside in the Winter? Yes, Lifetime Tiki Huts are impervious to ice, snow, wind, and rain. Can I install the Lifetime Tiki Hut myself, or do I need a contractor? Either option is available, depending on your skill level. Modular Kitchens and Bars (offered through another supplier), LED Lighting, Ceiling Fans, and Custom Colors are all available at an additional cost. Can the Lifetime Tiki Huts be used inside? 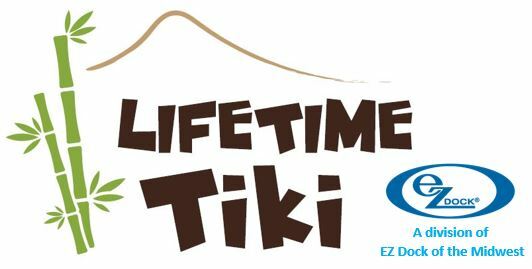 How long does it take to get my Lifetime Tiki Hut? As Lifetime Tiki Huts are typically made-to-order, lead times are roughly 4-6 weeks. Our company is working to develop a lower-cost residential Tiki Hut Kit that can be assembled by the end-user or a contractor. This unit should be available this summer.